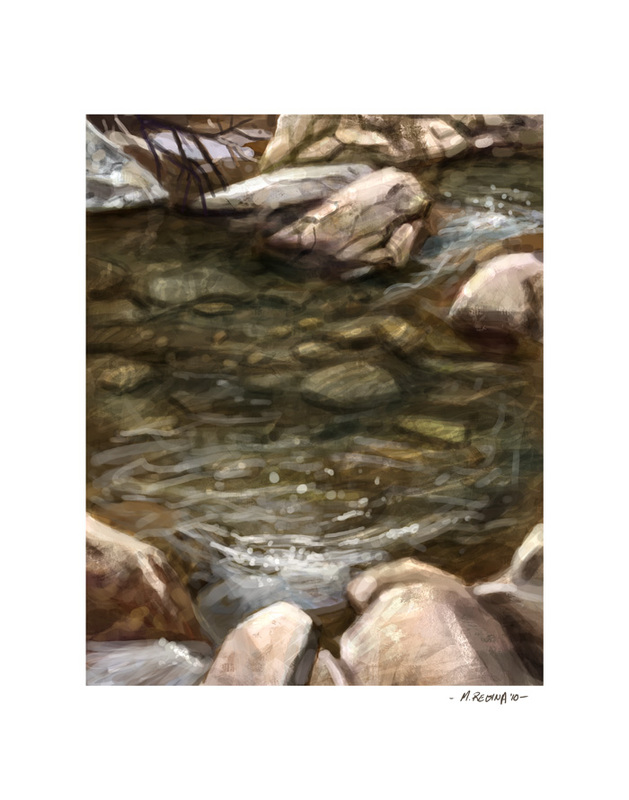 I spent some time today just relaxing and working on my first attempt at landscape painting in the digital realm. This is a an angle from a trip I took to North Carolina a few years back. Really happy with how it all came out. I've been looking at doing more of this sort of thing and selling them as prints. Love to hear if you all would be interesting in seeing that available in the store? Denver Jackson is one of those artists who's ability to convey energy and originality, makes me cry myself to sleep at night. OK, maybe not quite that, but he is darn good. His range of abilities and talent is inspiring. In some ways he's a jack of all trades, but I wouldn't dare add in the second part: "master of none." Denver runs a production studio, prints a small press comics anthology, draws comics, writes kids books, works with me as an assistant on Kazu Kibuishi's Amulet series and still has time for God of War 3. I know. It makes me sick too. Denver took some time out of schedule to answer some questions with me. Hope you all enjoy the interview. 1.) You're a pretty diverse guy when it comes to the material you create. Can you tell us a bit more about all of the projects you've got going? Currently, I'm animating a music video for an artist named Peter Shelley and I've just recently completed a short film titled 'the White Boned Demon.' I've as well just self published a storybook called 'Astra's Melody' and in the process of illustrating the 'Solis City'; graphic novel. I find the work process exciting going from different mediums of storytelling each time; from traditional animation to mixed media to comics. 2.) Something that seems to be catching a bit of buzz in your area is your comic magazine STRIP. What was the genesis of that and what has been the response? Marc Junker (the other co-founder) and I found our inspiration in a popular comic anthology called 'Flight.' This series of graphic novels contains amazingly diverse art styles and stories it really brought out something in us. We collaborated by selling our own little zines printed on ink jet at comicons - which was a terrible idea. We weren't concerned about the costs due to the fact that we were "living our dreams," so to speak. However, after a couple of years, more and more anthologies provided us with inspiration (Popgun, Afterworks, 24Seven) and we found ourselves working with more and more talented artists (including the third member of strip, Glen O'Neil) and decided that the idea of a comic anthology in the format of a free publication (available to pick up in coffee shops, etc) would be a fantastic method of promoting the growing comics scene on Victoria, on the island, and in Vancouver! The response has been great as we are constantly receiving emails from artists looking to contribute or get involved. 3.) And this is something that anyone can submit to for having their work showcased? Yes it is. We are constantly looking to make connections with fellow artists/new friends. 4.) What are the types of projects you are looking for? I usually will pick up a project that I know I will learn something from or that I am strongly connected with the story no matter the genre. I have many personal stories that I would love to tell however, I'm constantly doing freelance work to pay the bills. 5.) Your film work is pretty unique. I was first turned on to your work because of your adaptation of Kazu Kibuishi's Copper. What training did you have and any specific programs you use for your visual effects work? Well, I spent a year in art school were I'd be doing many art projects that sucked up the time I needed to complete my personal projects such as comics or film. In the end, I decided that my personal projects taught me a lot more than what school was doing so I dropped out. Other than that, I have had no prior training. Through the magic of the internet, there is a library of information on almost any topic! In terms of programs, Photoshop is essential! I use After Effects to do composting and animation work. For the adaptation of Kazu's Metropolitan, I worked with flash. 6.) That adaptation of Kazu's work lead to lending a hand, which is where we met, on his series Amulet. Can you tell us a bit about the work you've done on that series? The work on Amulet is by no means grand or spectacular. We basically fill in colors so that the painters can focus strictly on painting. Anyone who knows their way around Photoshop can do what we do. But we do help out a lot and Kazu and Jason have shown great appreciation for the work we put into it. It has also been such a great learning experience as they will also take the time to answer any questions we had if we weren't sure of something. 7.) Since working on Amulet, I've seen your work become more comics focused altogether. What's the drive behind that, and what projects are you preparing for the future? Working with comics is just another form of visual storytelling and you and I are doing the exact same thing; telling stories. It's no different than film. The passion comes from storytelling. With comics, stories can get told easier without relying on an entire crew/cast but they do loose that collaboration of many different ideas. 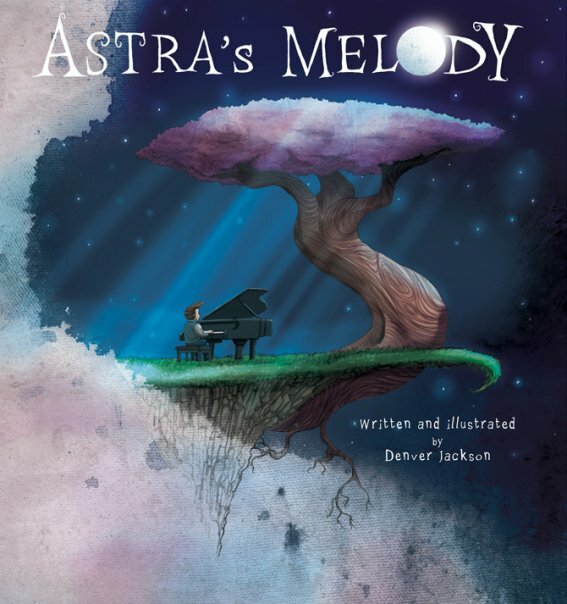 My friend Marc and I are currently looking for funding to fully animate 'Astra's Melody.' We're both working on a screenplay and starting the animation process (concept art, storyboards, etc). Hopefully, we'll be able to start filming mid July! Also, I'm happy to announce that Strip will launch its website very soon with three weekly comics by three artists, Glen O'Neil, Marc Junker, and myself. So keep this website in mind- www.stripcomics.com . The White Boned Demon trailer from Denver Jackson on Vimeo. I love, love love a good treasure hunter story. I love it! Two of my favorite movies of late have been the new National Treasure films and the always dependable Indiana Jones series. And now I am in love with the Uncharted game series. Recently a buddy of mine, Josh Ulrich, started up his own treasure hunter series called Jacki Rose. It's great fun and I highly recommend checking it out. But around a year ago I began writing and drawing a story called Kevin and The Golden Temple. It was a short story in the same vein as an Indiana Jones series but with a young twist and a dash more fantasy. At the time it was intended to be a short story, about 60 pages in total. As I kind of worked through the details of what the story was I saw a much better and more complex story I could tell. Unfortunately, or fortunately I guess, the project fell apart and I was left with this short, badly paced story (I had to compress the whole thing down to like 20 pages). I really fell in love with the adventure and characters I was creating and actually this was the idea I was going to turn into my next online project. Then The King's Game happened and I started working on the pitch for that project. And if you have been following me in the past you know that my previous agent left the firm I am signed on with and that left me to transition to another agent. Through much conversation with her, she basically answered what I had been feeling all along: I just need to actually finish a project and then we can go submit to publishers. Basically, I'm not at a point where pitching a book makes a lot of sense. I have no finished works to my credit, I only have pitches and ultimately very little presence in the bigger comics world. So, how can I expect a publisher to get on board with me? This took a bit of time to swallow, though I knew it was true. She asked that I work some more on The King's Game, but ultimately started debating whether that was the best project for my new found devotion to completing projects. Thus the Kevin story reared its head again. This story about Kevin is a blast of a tale. Adventure, fantasy, humor and other worlds await our little treasure hunter and I felt that this project most speaks to the audience I want to right now and because of the story structure I can actually finish chunk of it faster and have completed material to show to everyone. Basically the book will divided into three installments at about 100 pages each. Targeted at a younger audience and I will be looking to put out one volume a year. I am planning on issuing this online as a webcomic so, that will be coming up online by the end of this current month. Sorry if anyone out there was jonesin for some King's Game. I am very much excited about that book, but the tone, length and spirit of the material is just not something I feel ready to tell yet. It will be on the docket for the next go round. But for now, as Josh and I say all of the time now, make books son!